Dr. Stewart was the first dentist in Michigan to be accredited by the prestigious American Academy of Cosmetic Dentistry (AACD). While there are over 6,000 members of the AACD, fewer than 400 have passed the rigorous process of becoming accredited, a process of presenting “before and after” pictures of actual patients before a panel of examiners. He also has attained Fellowship status in the Academy of General Dentistry (AGD). Fewer than 10% of dentists nationally have become fellows in the AGD. 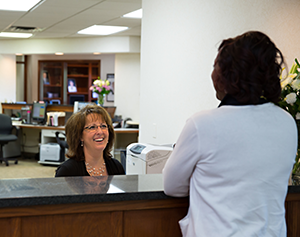 Each and every one of our patients gets the level of service and care they need. Dr. Stewart and Dr. Hull take the time to understand your wants and desires, and discuss the possibilities. We are extremely proud of the dentistry we do and are always happy to share “before and after” pictures of our work. Come in for a stress-fee smile consultation and see how we are different. Enjoy a cup of coffee or juice and comfortably discuss your needs, goals and dreams. Whether it is general dentistry or cosmetic dentistry that you are seeking, our staff of assistants and hygienists has had hundreds of hours of continuing education to be able to assist you. Additionally, we could not provide the beautiful dentistry we do without the support of outstanding dental technicians. We are honored to work closely with some of the best laboratories in the country. The skill and judgment of our team is second to none. We are committed to providing you with the best and most current dental care at every level. Our practice has a reputation for offering the most complete dental care in a friendly, inviting, and professional environment. When you visit our practice, you’re not just another smile — you’re family! We understand that you have a busy schedule, and our office staff will gladly work with you to make sure that appointments are scheduled at your convenience. We provide a variety of dental treatments that are comfortable, safe, and effective. Our practice is equipped with the latest dental technology, so that we can provide complete care for your smile.